Published by Burch & Polk, 1871; this is a 1970 reprint by Unigraphic, Inc.
Cover has very light wear. Inside pages are clean. 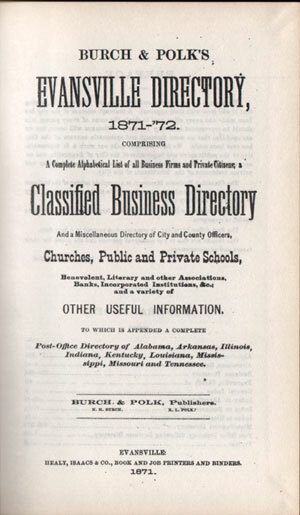 An alphabetical directory of residents of Evansville, Indiana in 1871-72 that includes the name of the resident, their occupation, and where they resided. Also includes a business directory. Hard cover, a total of 452 pages. Also includes numerous business ads.